Please do not reproduce the photograph or any wording from this page. If you want permission to use this photograph or narrative please contact the College on email@richardtaunton.ac.uk. Harry’s parents were Henry, aka Harry, Raymond born 1854 and Alice Elizabeth born 1869, both of whom were born in London. Harry was the eldest of four known children by the time the 1911 census was taken. His parents had been married for 16 years but we have not been able to trace evidence to support this. In the 1901 census Harry (transcribed as Gardener), with his parents and sister Alice, lived at 102 Priory Road, Portswood, Southampton. His father was working as a House Decorator and Painter. By 1911 the family had moved to No. 99 in the same Priory Road. Henry was still a House Painter in the building trade. Harry had left home, moving to Portsmouth, where he had joined the Royal Navy as a Boy Artificer. In 1917 in Southampton Harry married Olive Florence Veck who was born in 1896 Southampton. At the time of Harry’s death Olive was living at 28 Haslemere Road, Southsea. 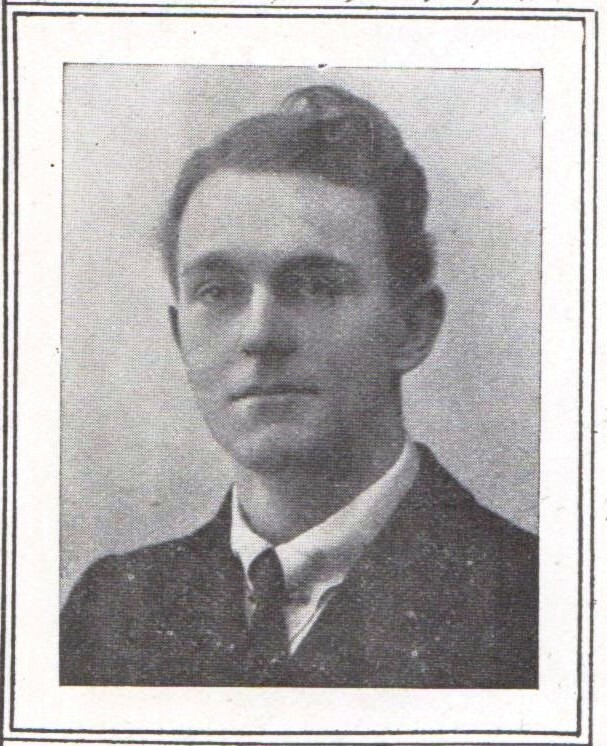 And following is death Olive married again in 1922 to Edward W Glendinning. Education and Employment: Harry was born in Southampton in 1895. While at Tauntin’s he earned several prizes for design, including two for the Speech Day programme. He passed the exam for Boy Artificer in 1910 and was appointed to H.M.S. Fisgard. Life during the war: Harry passed top of his class in mechanical and machine drawing in 1914 and was then appointed Chief Petty Officer on H.M.S. Fisgard. He was an Engine Room Artificer for the Royal Navy, serving on H.M. Submarine D3. The D3 was sunk by the French, who had misidentified the submarine’s identification missiles as an attack on their ship. Everyone on board the submarine drowned in the English Channel. Harry died on 15th March aged 22 years. For his service to his country, Harry was entitled to the Star, British War and Victory Medals. D3 met her fate on 12 March 1918. She was mistakenly bombed and sunk by a French airship AT-o off Fecamp in the English Channel and lost with all 29 hands. AT-0 was patrolling when at 1420 a vessel was spotted to her north east. The airship drew close for recognition purposes and according to her commander, Lieutenant (RCN) William McKinstry Heriot-Maitland-Dougall, the submarine fired rockets at her. Four 52-kg bombs were dropped by the airship. The submarine disappeared but several minutes later men were seen in the water. Attempts were made by the airship to rescue the men but it proved too difficult. The airship withdrew to seek help but all the men had drowned by the time it arrived. It is clear that D3 was the victim of a serious identification error on the part of the French airship, with identification rockets being mistaken for aggressive gunfire.